Is Money the Source of Your Joy? 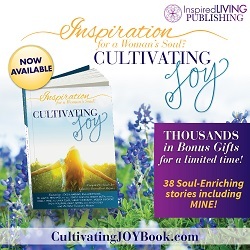 You may have noticed recently that I’ve been sharing a lot about the launch of my co-authored book, Inspiration for a Woman’s Soul: Cultivating Joy – I’m SO proud of the brave stories that myself and the other authors shared about their tragedies and triumphs in life that have marked their journey! (And I have to admit that it’s pretty darned cool that we hit 4 (yes, four!) Amazon best-seller lists during the first few days of our launch, and that it’s inspiring thousands of women around the world. 🙂 ). And what I’ve noticed while being part of this project and inside of the conversations with my clients and others who I’ve been talking with is that the concept of joy is often misunderstood. What is joy? What creates joy in my life? What are the barriers to joy for me? As I’ve been in these questions with others, what I’ve learned is that often times people are making a connection between joy and money – that, in essence, once they have more money they’ll be able to then be joyful. While I’m not judging how/what people think, for me this is a HUGE mistake in terms of being able to attract joy in our lives. We’ve got it backward! What do I mean? When people believe that when they have the money first, then they’ll experience joy they are waiting on an inanimate object to show up and create what they want in their lives. Instead, what if we chose to create joy in our lives first, and then as we walk around our lives happy and full of energy, accepting and being grateful for the amazing things that we already have, then we were able to attract more money into our lives? YES, it actually works this way! It is our “inside job” to choose joy first, and then generate the irresistible energy behind it that has us walk around our lives glowing and radiant which is like a beacon in our world to attract the abundance that we say we want. So it’s not about working hard first to create the money so that we can then have joy. We get to decide how/when we’re going to create joy in our lives, and then let the energy of that unleash into our space and the world and wait to see the amazing money manifestation machine start clicking away. Not sure just yet if you’re buying into this process? I understand, so let me share some personal examples to illustrate my point. Example #1 – I’ve known since I was a young child that I was born to teach. And as an adult, I’ve realized that not much gives me joy than to support others in learning something new and possibly even breaking through something that’s holding them back. So, I’m always in “teaching” mode and listening for opportunities to contribute because it creates such joy for me that my head hits the pillow at night fully satisfied that I made a difference. As a specific example, a few years ago I spent hours upon hours creating a free event for others called The Financial Health Telesummit – it was filled with financial experts talking about different aspects of financial health (taxes, financial planning, insurance, etc.) and supporting others to learn more about those financial concepts and take action in their lives to educate and empower themselves around money. You might notice I said it was a free event; I made no money directly from it (although I share the information now as an information product), and I dove all in with my heart to make a difference. The result? 8 new private clients in 35 days (and not one of those clients came from the telesummit either – they just “randomly” showed up!) and by far the best financial month I’ve ever had in my business. And it was joyful and fun to do every single minute of the program! Example #2 – This past month (October 2015), I had so many opportunities it felt a little daunting at the beginning if I’m honest. The book launch, opportunities to speak at a big conference and in other places, and personally speaking I had some incredible opportunities to take leaps of faith and create the life of my dreams without understanding the outcome (which can be scary). And all throughout this time I was immersed in the idea of cultivating joy and I spent a lot of time revisiting how I wanted to create joy in my own life…and my personal insights were powerful. The results this time were equally profound as I sensed my joy quotient rising and the financial results in my business have begun to substantially grow as well. In both instances, I focused on JOY as my intended outcome – I allowed myself to enjoy the process and by simply being with what I was doing the results were amazing. So I invite you to think about what would create joy in your life, and how you can start doing that for yourself today. Not tomorrow, not in one week – TODAY. Life is now and it doesn’t wait for us; every moment matters and it’s never too soon to begin cultivating joy in our lives and creating the lives of our dreams and manifesting the amazing abundance that we all deserve!